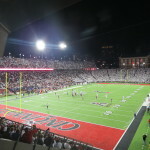 A full walk around the stadium’s concourse will lead past the original entryways on one end to a connecting skywalk, high-tech scoreboard and indoor concession seating on the other end. 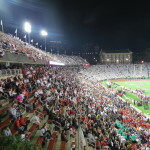 The facelifts do not strip the charm from college football’s third oldest active stadium, and the fans consistently prove that the energy level is not in need of renovation. 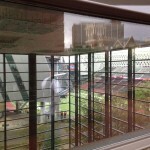 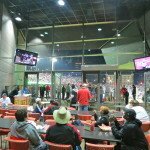 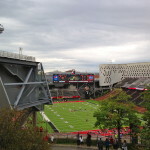 This arena’s physical structure is not the only major change since my last visit to Nippert Stadium in 1999. 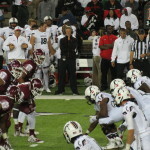 The Bearcat football team has risen to national prominence. 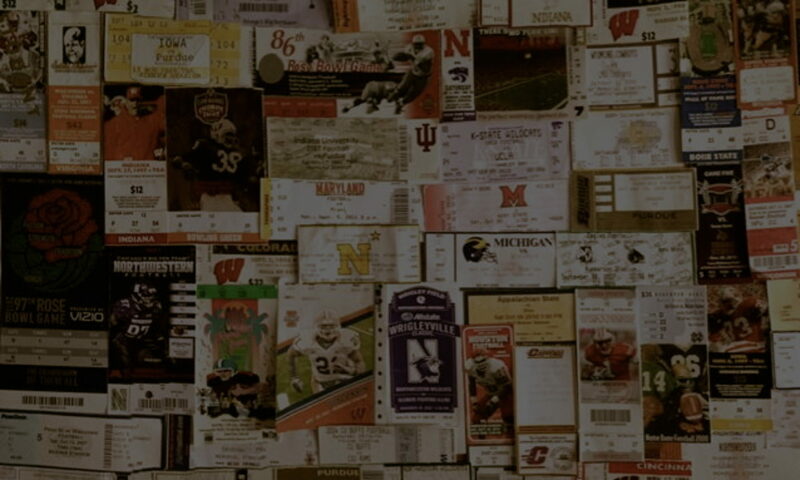 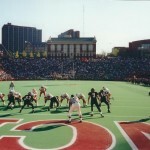 With upsets over highly acclaimed opponents and appearances in major bowls, they are a major threat to their competition. 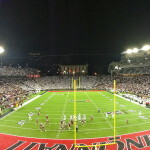 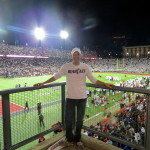 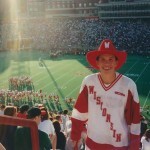 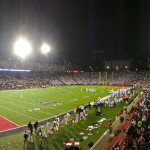 In addition, the implementation of the “CatWalk” has been a well received new tradition on game day. 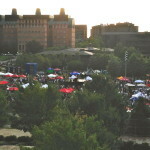 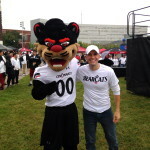 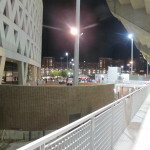 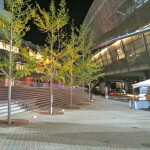 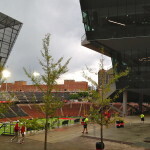 Fans who set up their tents and tailgate along the pathway to Nippert Stadium can take part in welcoming the team as they make their way over for the game. 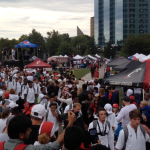 The band and Bearcat faithful line up to greet the players and pump them up for their gridiron battle. 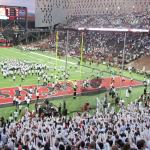 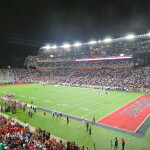 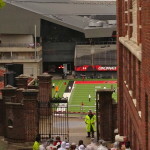 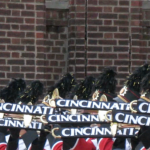 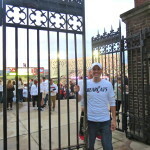 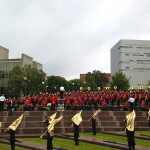 The most recognizable and long-standing tradition at Cincinnati involves the band’s entrance to the field. 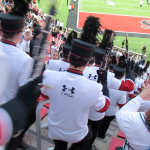 Standing on the concourse along the perimeter of the student section, the Bearcat Marching Band begins with a fanfare and then chaotically races down the aisles through the students evoking massive cheers and thrills. 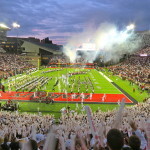 The Charge Down the Stadium Steps, as the tradition is known, culminates with chaos finding form on the field as the band begins to musically entertain. 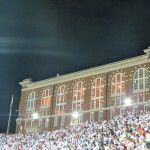 A tradition started in 1954, it remains one of the most unique entrances in college football. 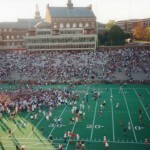 Whether it be stadium renovations or gameday traditions, the atmosphere at Nippert Stadium perfectly marries the old with the new. 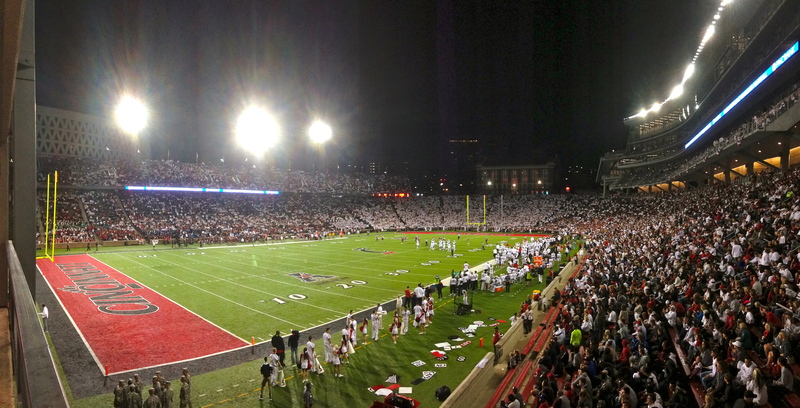 ESPN’s Scott Van Pelt refers to it as “one of the gems in college football.” There’s no doubt that it certainly sparkles on the crown of the Queen City.